Only ”Console Pay tenants” invoices appear in the Console Pay Invoices Tab. 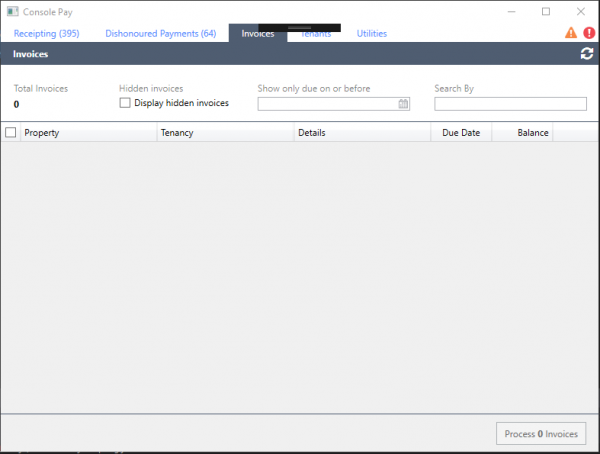 Click Process X invoices – where x equals the number of invoices selected. Invoice payment requests are created and sent to Ezidebit for processing. Note: Invoices will be processed on the day you process them, we recommend ensuring your tenants are aware of the direct debit payment method for any invoices raised. IMPORTANT: We recommend amending your invoicing template (remittance advice) to show the preferred payment method is Direct Debit to avoid your tenants making payment by another method once you have scheduled the payment. refer to Adding a Remittance Advice to Invoices, if required.